The twenty-eighth Soundtrack of the Week is two for the price of one, both composed by David Shire: 1975's Farewell, My Lovely and 1988's Monkey Shines. 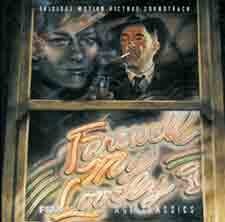 Farewell, My Lovely has a haunting jazz score, with a main theme that reminds me of John Barry's "My Love Has Two Faces", from the movie Deadfall. Most of the music is along these lines, though there is some excellent dramatic scoring also. Monkey Shines benefits from virtuoso microtonal flute playing and African percussion improvising with an orchestra. I was surprised by how much I enjoyed these two scores. I saw Monkey Shines when it first came out and remember it as being ludicrously bad. I should probably give it another chance. My tastes have changed a bit in the last twenty years. I can't remember if I've seen the Robert Mitchum Farewell, My Lovely and/or the Robert Mitchum The Big Sleep, which followed it. I have this theory that anything with Robert Mitchum in it is worth watching, which is why the other night Alice and I tried to watch Agency, a probably really bad movie from 1980 which starred Robert Mitchum and Lee Majors. I was really excited to see these two together, but the DVD I borrowed from the Brooklyn Public Library had serious technical difficulties and we were only able to watch the first five minutes.